You are on the list Richard, the race is still on but keep checking. That is great news - thanks. Have you heard from Rob? Sam picked up a injury Tuesday, but Paul has patched him up to get him through Sunday. When you say you will be there I hope that includes Kate. yup + kate. Rob thinks he will. Fingers crossed they don't cancel because of the predicted bad weather on Sunday. Many congratulations to everyone for the run today and over the whole season. Yes. 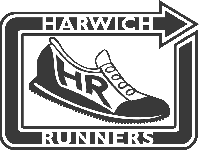 A brilliant effort for Harwich to achieve such an amazing placing, not far behind Harriers and way ahead of Springfield. It wasn't long ago we would struggle to stay in Pool A but now our strength in depth means we are taking on and beating clubs much, much larger than ourselves. A massive well done to everyone who has...er...enjoyed this weird and wacky season on the XC circuit for the Black and Whites. Congratulations also to the new runners this year who have done so well, survived and thrived. Impressive stuff. I, for one, am really sad it's over for another year...and not only because of Becky's amazing cake! Still, at least the time off will allow my trench-foot to recover from yesterday. I've emailed the Hares thanking them for putting on the race but suggesting that next year they perhaps just go the whole hog and make it a Triathlon by simple insertion of a bike section! Completely agree with Dan's comments too - it was wonderful to see how many of us stayed to hear the final results and placings yesterday. Shows the great spirit running through the club at the moment. Brilliant run by you too Dan by the way...a fine way to round off an incredible first XC season. Well done to Graham for the win and to all the others who have enjoyed a great season hopefully i will join you all next year (when this pesky knee is ok ) as i like a bit of mud!! Perhaps you would be good enough to pass my congratulations to every member who participated, or supported the club throughout the cross country fixtures. I have read with eager anticipation your emails after every race, and have taken great satisfaction in seeing the club and all its runners do so well. As someone who has represented the club over various years, i always felt welcomed and pleased when i pulled on the black and white. its inspired me to train again, or perhaps thats the sunshine. so once again well done to the champions of 2011? ?